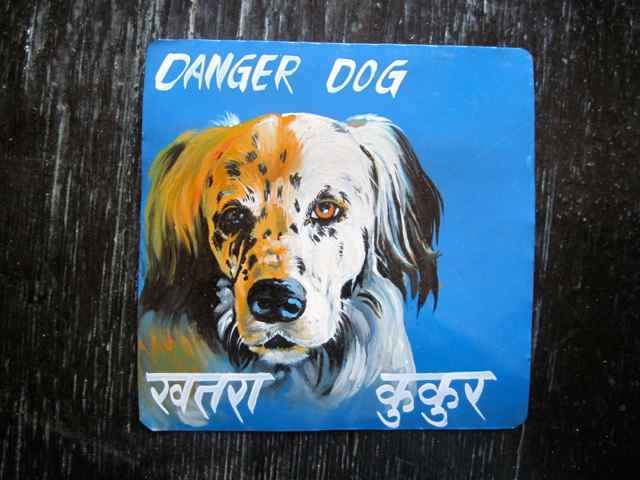 Available hand painted Beware of Setters signs on metal. This handsome Setter named Guinness is stunning in his portrait by Nara of Asha Arts. This is a soulful portrait of a beautiful dog. 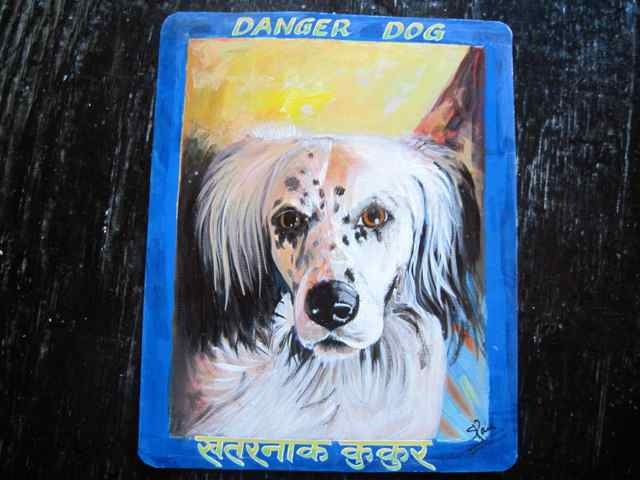 This hand painted portrait of the black and white Setter named Guinness is a winner. Sanjib paints using acrylic so his paintings cannot be hung outdoors. Amar does it again with his lovely and soulful portrait of Eliot the Gordon Setter. 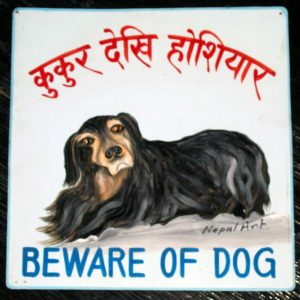 This portrait of Eliot the Gordon Setter by Pulkit has an Edvard Munch feel to me. Very wavy and sensuous lines on this one. 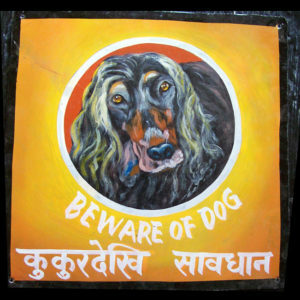 Eliot the Gordon Setter as painted by Sagar. 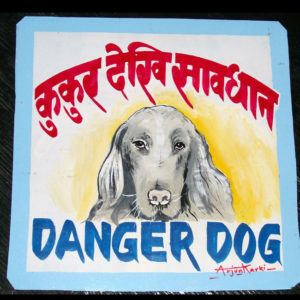 This one was one that Sagar painted on spec, hoping that I would buy it. Who could resist? I love it when my artists think like businessmen. This portrait of an Irish Setter was from a black and white photo. 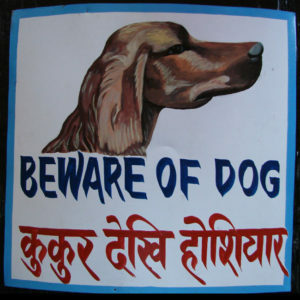 Arjun did not understand that the Irish Setter was supposed to be a red headed dog. 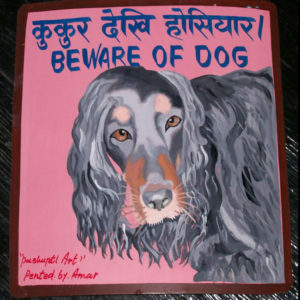 Nabin painted this cartoonish version of an Irish Setter on a 16’x12′ piece of recycled metal. 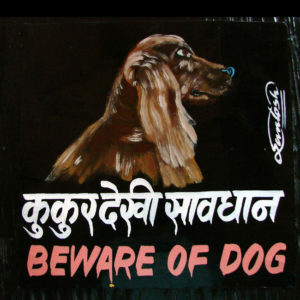 Santosh Shrestha from Lakeside in Pokhara painted this Irish Setter in the traditional Nepali signboard style. 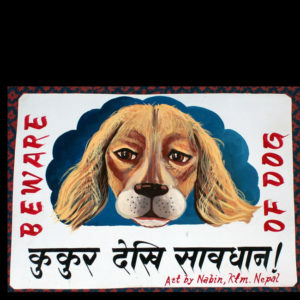 This is an example of a traditional Nepali beware of dog sign and is currently available at Nomad in Boston. Please contact them at (617) 497-6677, and they will be happy to assist you with your purchases. Their website is NomadCambridge.com.